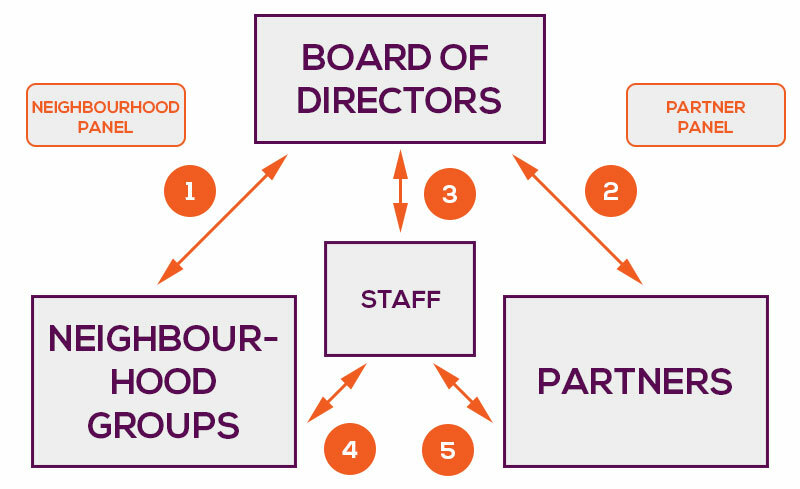 The GNSC is made up of a Board of Directors, Staff, the Neighbourhood Groups, and Partners. Read below to learn how all these groups interact to form the GNSC. One representative from each neighbourhood group meets on the Neighbourhood Panel which meets four to six times a year. The representative is appointed by the neighbourhood group to share successes, troubleshoot problems, and talk about their own neighbourhood issues. Five representatives from the neighbourhood panel also sit on the Board of Directors. These representatives are nominated by the panel, but might not actually sit on the panel. Anyone from the group can sit on the board of directors. One representative from each partner organization joins the Partner Panel who meets every second month. There are 10 partners organizations in total. In addition, one representative from five of the partner organizations also sits on the Board of Directors. The panel nominates the representatives to the board. Brendan Johnson, the Executive Director of the Coalition sits on both panels and helps to keep them informed of what’s happening at the GNSC. Brendan also sits in at the board meetings which happen monthly, helping to set the agenda and represent the GNSC staff at meetings. GNSC staff interact with the Neighbourhood Group staff and volunteers regularly to help with hiring, mediation, staff support, strategic development and more. Staff work with Partners to help provide clarification, share ideas, and be a liaison between neighbourhoods and partners. Have more questions about how the GNSC works? Feel free to get in touch with us and we will be happy to answer and questions or concerns.